MyFormsFinder Toolbar is an application you should erase as soon as you find it on your computer because it is not that useful even though it promises to act very beneficially. Users who install this toolbar on their PCs find a toolbar added at the top of their browsers and their homepages changed. The same will happen if MyFormsFinder Toolbar enters the system illegally. People who install this software on their computers often do not know that it will change the settings of browsers too because it provides this information in small letters. If you do not like this feature too, or simply cannot remember downloading and installing this browser extension yourself, you should delete MyFormsFinder Toolbar right now from all your browsers. You will definitely not regret doing that because this software is not legitimate. Instead, it might cause many problems. How does MyFormsFinder Toolbar act? Let’s begin by describing MyFormsFinder Toolbar. First of all, it has been found that this application is developed by Mindspark Interactive Network, Inc. It does not differ at all from other programs developed by this Company, so it was not hard at all for us to find out how it acts. Once it is inside the system, it places a toolbar on every browser. You will find it at the top with a bunch of buttons leading to third-party websites. Also, a new homepage containing the Ask.com search box will be set. 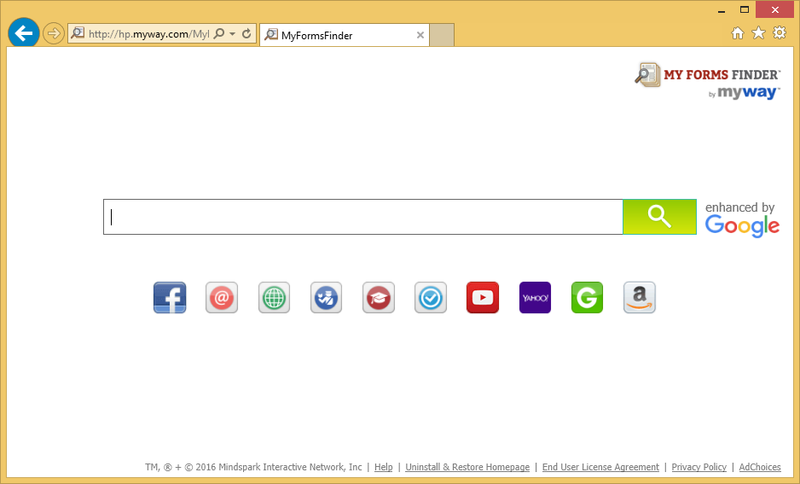 Even though this search engine is not considered to be bad, the developer of MyFormsFinder Toolbar could have modified it, so now it might be showing advertisements. Many users find these ads annoying, but this is definitely not the only problem associated with them. It is very likely that these ads can also redirect to bad web pages since they promote all kinds of websites. Finally, nobody knows whether buttons on the toolbar will really take users to good websites. The fact that MyFormsFinder Toolbar collects information about users is another issue here. It has been found that it might record details about people and their activities so that it could display commercial advertisements for them. Evidently, it desperately needs clicks on those ads, but you should ignore them all and go to implement the MyFormsFinder Toolbar removal instead. How did MyFormsFinder Toolbar enter my computer? Bundling is the main distribution method used by cyber criminals to promote untrustworthy software. Undesirable application comes in a bundle together with freeware and shareware so that it could hide well. You might be able to spot these additional applications if you read what it is written for you in the setup wizard. Also, it would not be worse to install a security application on the system. How can I uninstall MyFormsFinder Toolbar? The MyFormsFinder Toolbar removal should be implemented as soon as possible if you no longer want to see an undesirable website set as your homepage and the toolbar at the top of the browser. To delete MyFormsFinder Toolbar manually, you have to erase its extension and then change the homepage. As can be seen, it is not so easy to remove MyFormsFinder Toolbar. If you feel that too, you should know that you can remove MyFormsFinder Toolbar automatically. Get a scanner first!